This is a guest blog post by Kishshana Palmer, the presenter of our free webinar, “How Small Organizations Win: How to do Big Marketing on a Shoestring Budget.” Click here to watch now. You see them every day. On Instagram, on Facebook and IRL (in real life). Organizations that seem to win at marketing their mission and their programs. They are everywhere and their donor family (and budget) is large! But the question is, how are these organizations winning at the game of marketing well? From my experience, they are doing three things right. Win #1: They Have a Plan. A real one — specifically a marketing strategy and implementation plan. Your marketing strategy should be a part of your overall organizational plan. It outlines your organization's overall game plan for how you'll find and attract donors and other important stakeholders to your mission. Having a plan means making some strategic choices about where you are going to focus resources and what type of results you are going to get. Win #2. They Have Professionals on Staff (or at least on speed dial). Scrappy organizations do what they need to with the resources they have. Some teams are so good at “making something out of nothing” that there is a resistance to putting resources toward hiring marketing and communications professionals to design, implement, and manage those efforts. Organizations that are winning at marketing have professionals on staff — and often hire external expertise — who wake up thinking about how to elevate the brand, message and mission of that organization. Win #3. They Have a Growth Mindset. Now, this really applies to organizational leaders. You have to want your organization to grow. At this point many people ask me, “What do you mean I have to have a growth mindset?” Here’s the thing. A growth mindset is a frame of mind — a belief system — that each of us adopts to process incoming information. People with a growth mindset look at challenges and change as a motivator to increase effort and leaning. Since marketing is an evolving discipline and is accelerated by social media and how we ingest content, nonprofit leaders who have a growth mindset see marketing as an opportunity to grow the organization’s footprint and reach. For example, I recently worked with an organization whose Chief Executive was so humble I couldn’t pay them to brag about their accomplishments. Unfortunately, they weren’t doing a good job of marketing their organization either. One of the first things we had to work through were the limiting beliefs the Executive Director held about money, publicity and ultimately their worth. That needed to happen before we thought about how to showcase the organization. Once we had a breakthrough in mindset, everything changed. The Executive Director was excited about sharing not just the work of the organization, but also the needs of the organization in an authentic way. 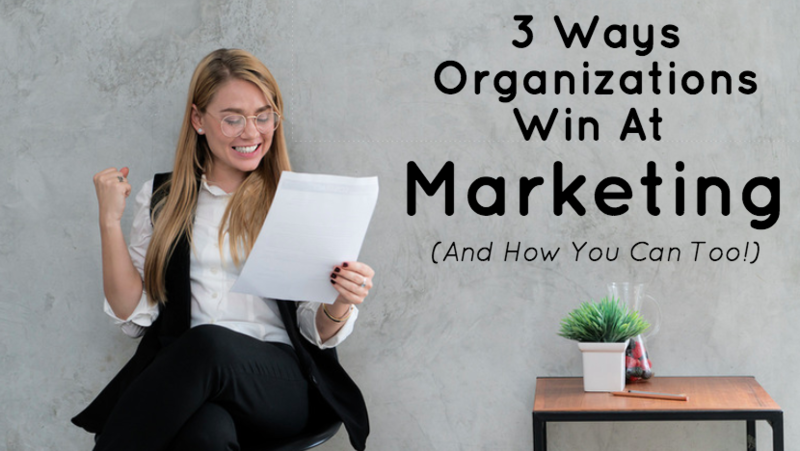 There’s so much more that goes into your organization being able to win at marketing, but these three ways will give your organization a head start and the competitive advantage you need to succeed. If you’d like to learn more about how to market your organization, especially if you’re on a tight budget, please watch my free webinar on “How Small Organizations Win: How to do Big Marketing on a Shoestring Budget”, hosted by Wild Apricot. When she isn't whipping up new book ideas, Kishshana Palmer (CFRE, BoardSource Certified Governance Trainer, and AFP Master Trainer) is a national speaker, trainer, and coach with a 16-year background in fundraising, marketing, and talent management. She’s a supernova on any stage and platforms due to her charismatic and candid delivery. It doesn’t matter if she’s speaking about philanthropy, living your most authentic life, or diversity, the energy she brings to the stage is always entertaining and edifying.